Ukrainian media in unison are misquoting Dutch investigators as accusing Russia of shooting down Malaysian Airlines flight MH17 over eastern Ukraine in July last year. The concert of reports by Ukrainian media on Thursday claimed that the Dutch team had established that it was a Russian Buk surface-to-air missile that shot down the Boeing airliner, killing almost 300 on board. The fact is they didn’t. “I can say for sure they are not correct,” Dutch Public Prosecution Service (OM) spokesman Wim de Bruin told RT. “We are not yet ready to take any conclusion,” he added. The Ukrainian reports, including those by major outlets like TV channelTSN or popular newspaper Segonya, apparently originate fromUainfo, a website with a slogan“all the truth from blogsphere,”which aggregates reports it encounters in various social media. It cites a report by Dutch national broadcaster Nederlandse Omroep Stichting (NOS) on the state of the investigation. The report written by NOS Editor Robert Bas claims that the investigation suffers from poor communication between Dutch police and prosecutors with the national intelligence service AIVD, which, according to NOS, withholds some of the information pertaining to the investigation. The NOS does mention the theory of MH17 being shot down by a Buk missile, but does not claim that the Dutch investigation confirmed it. Instead it cites online videos as the source of the allegation. The report adds that Dutch investigators spoke to eyewitnesses in Ukraine, without detailing the substance of those accounts. In a statement on its website, OM denied that there was any obstruction to their investigation into the MH17 tragedy from the AIVD. The Netherlands published a preliminary report in September 2014, but didn’t go any further than confirming that the plane was destroyed in mid-air by a large number of high-energy projectiles, leaving a window for speculation as to what weapon was used in the downing of the aircraft. A full report is expected in October this year. Malaysian Airlines MH17, en route from Amsterdam to Kuala Lumpur, was shot down over rebel-held eastern Ukraine on July 17, 2014. Everyone on board, including 283 passengers and 15 crew members were killed. The majority of victims were Dutch citizens. 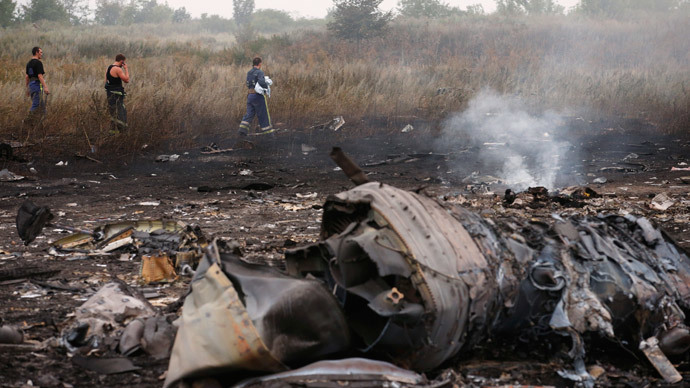 Kiev and its Western sponsors were quick to accuse either the rebels or Russia of taking down the plane. The Russian Defense Ministry published radar data pointing to other possibilities, including an attack by a Ukrainian fighter jet, as the cause of the tragedy.